For more than 30+ years, E&S has been delivering Digistar systems to planetariums around the world. 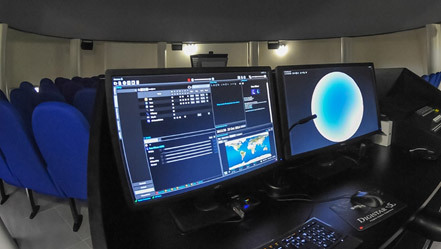 Now, Skypoint Planetariums in collaboration with Evans & Sutherland has developed Digistar Lite, the ultimate solution for small fixed domes or budget-restricted projects up to 10-13m. Digistar Lite uses a customized version of Digistar 6, the world’s leading digital planetarium system. The biggest and most important planetariums in the world use Digistar, totaling more than 550 planetariums in the world. Digistar Lite includes the core features of Digistar 6, with optional features like the Digistar Cloud Library, Show Builder, Dome Casting and a few others available for purchase as separate plug-ins. This has allowed us introduce the new Digistar Lite line at a very competitive price with advanced features not previously available in small planetarium systems. Digistar Lite represents our starting point for a fixed solution. Of course our main line of fixed systems use Digistar 6 with projector solutions from 2D to 3D, up to True 8K resolution. The entry level of Digistar 6 line is the Digistar 6 SP 2560x1600. This system is based on a single channel but will permit in future to be upgraded to a two-channel system, always installed in the center of the room or on cove too if preferred. 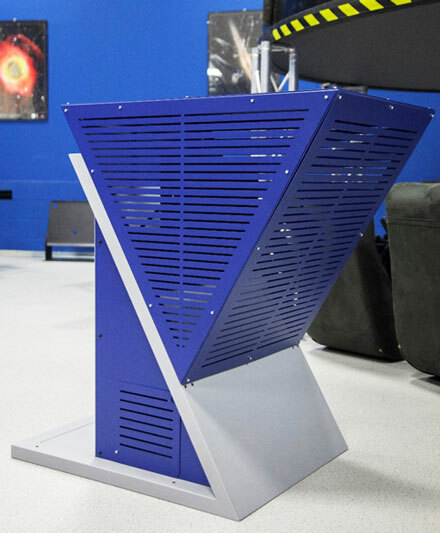 All fixed systems are supplied with a customized chassis to bring the projector at the right height depending on the size and position of your dome. For the 1200 and 1600 pixel using F-series projector, Skypoint can also offer different type of fisheye lenses (160-180° of vertical projection angle) to adapt the height of the chassis and minimize the potential interferences with visitors’ view. Skypoint usually offers for all of its fixed systems an elegant, color- customized metal chassis to provide a beautiful design also when lights are switched on. For installations where a starball, opto-mechanical planetarium is already in place and customer wants to keep it, the Digistar Lite can be supplied with an optional elevator controllable directly from Digistar. The fixed version includes mini iPad, two monitors, keyboard, mouse to operate the system from the operator console or from the room with the iPad. See Deliverables for futher information. Ambient RGBW Leds can be provided as optional, controllable from Digistar.